Parents instead of forbidding their children to use social networks, might like more to monitor their activities using some online tool and in this manner to protect them being cyber bullied. Maybe there will still be parents who would like to prevent access to particular websites or to establish category based filtering aiming to protect them, for example filtering social media sites as one category, online games as another, etc. But this could be a little bit tricky, especially if you consider child psychology that “forbidden fruit is the sweetest”. Therefore, it will be good to find out how to monitor your children and see what they are doing on social networks, with whom they are establishing relationships, what are the photos they are exchanging, etc. I would rather call this intention carefulness of a responsible parent than spying. It seems that some companies are taking such big responsibility and putting their efforts to develop and to provide various software solutions how to help parents to grow children in a good manner as a next cyber generation. One of these solutions is Avira’s Social Network (also known as Social Shield). It is web based solution and the only requirement is parents to register through their Facebook account (or eventually with an email address). Then, they need to invite their children through this platform to do the same. As for now, Avira’s Social Network can collect information about your children’s activity from four social networks: Facebook, Google+, Twitter and FormSpring. Overview: place where all alerts and activities found for your child are shown. 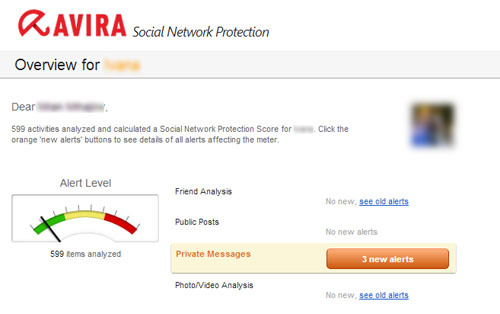 There is an alert level indicator which value depends on alerts found in analyzing four categories: friends, public posts and private messages, all photos and videos from all social networks connected to Avira’s Social Network. There are two levels of severity, red critical alert and yellow warning alert. Activities: it is kind of timeline where all activities from all social networks are being recorded as they occur over the time. Parents can have a general overview of all details, and can go back in time to investigate a particular incident. The good thing is that Avira’s engines are crawling the content and any suspicious content is being highlighted (for example, bad words or something misleading). Friends: section where all your kid’s friends are listed. Parents can check whether the friends are real ones they claim to be, or fake ones. They can see with whom their kids are hanging out, as well. Photos: This is section which contains all photos posted by your children or photos where your children have been tagged. It helps parents to prevent potential cyber bullying and to manage online reputation of their children. Besides regular checks on the web, parents can read reports delivered straight in their mailboxes by Avira.